Apple has released its latest versions of the MacBook Pro with Thunderbolt — the next generation of I/O that supports data transfer rates up to 10 Gbps. 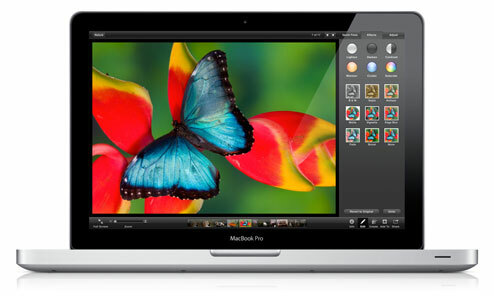 The new MacBook Pro 15″ and 17″ models also come with quad-core Intel Core i7 processors. The smaller, 13″ models feature dual-core Intel Core i5 and i7 processors. Apple says all their newest MacBook Pro models are essentially two-times faster than the previous. For graphics, the new Apple ‘Pro’ models feature AMD Radeon graphics on the 15″ and 17″ sizes, and Intel HD Graphics 3000 on the 13″ sizes. Other features include Turbo Boost 2.0 (for improved processing when applications such as Aperture 3 or Final Cut Pro), Hyper-Threading (allowing two threads to run simultaneously on each core), and up to 8MB of shared L3 cache with integrated memory controller. The new MacBook Pros are priced from $1,199 to $2,499. Previous Previous post: How do I find HD channels in my area?